Karl Valentin (born Valentin Ludwig Fey, 4 June 1882, Munich – 9 February 1948, Planegg) was a Bavarian comedian, cabaret performer, clown, author and film producer. He had significant influence on German Weimar culture. Valentin starred in many silent films in the 1920s, and was sometimes called the "Charlie Chaplin of Germany". 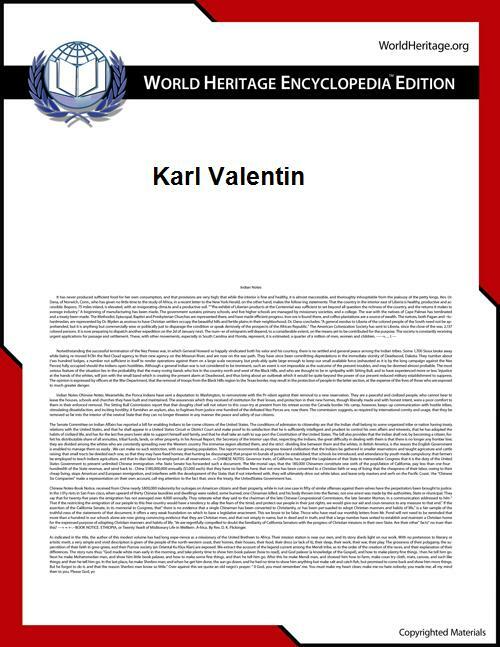 Karl Valentin came from a reasonably well-off middle-class family; his father had a partnership in a furniture-transport business. Valentin first worked as a carpenter's apprentice, and this experience proved useful in the construction of his sets and props later in life. 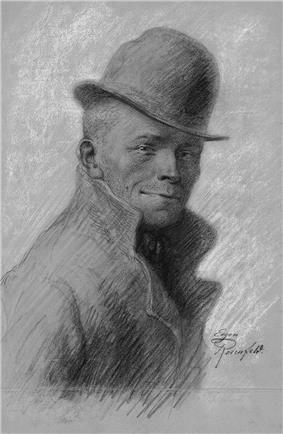 In 1902, he began his comic career, enrolling for three months at a variety school in Munich, under the guidance of Hermann Strebel. His first job as a performer was at the Zeughaus in Nürnberg (Nuremberg). In the wake of his father's death Valentin took a three-year break from performing during which he constructed his own twenty-piece one-man band (with which he eventually toured in 1906). Soon Valentin was performing regularly in the cabarets and beerhalls of München (Munich). He developed a reputation for writing and performing short comic routines, which he performed in a strong Bavarian dialect, usually with his female partner, Liesl Karlstadt. Valentin also made numerous films, both silent and with audio; but it was as a stage performer in cabarets that Valentin built a reputation as one of the leading comic performers in Germany during the Weimar Republic. In 1923, Valentin appeared in a half-hour, slapstick film entitled Mysteries of a Barbershop (Mysterien eines Friseursalons). The film script was written by Bertolt Brecht, directed by Erich Engel, and also featured Valentin's cabaret partner, Liesl Karlstadt, as well as an ensemble of stage, film, and cabaret performers, including Max Schreck, Erwin Faber, Josef Eichheim, and Blandine Ebinger. Although the film was not immediately released after it was completed in February 1923, it has come to be recognized as one of the one hundred most important films in the history of German filmmaking. The previous year, 1922, Bertolt Brecht, had appeared with Valentin and Karlstadt in a photo of Valentin's spoof of Munich's Oktoberfest. Brecht regularly watched Valentin perform his cabaret routines in Munich's beerhalls, and compared him to Chaplin, not least for his "virtually complete rejection of mimicry and cheap psychology." Karl Valentin and his partner Liesl Karlstadt performing a routine from Valentin's sketch Tingel Tangel, 1919. 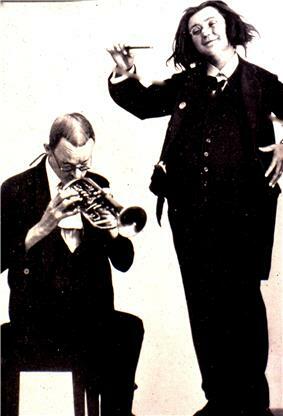 In this routine, Karlstadt impersonated a male orchestra maestro, while Valentin pretended to follow a complicated orchestral score on the cornet. This anecdote has become significant in the history of German theatre, since it was Valentin's idea of applying chalk to the faces of Brecht's actors in his production of Edward II that Brecht located the germ of his conception of 'epic theatre'. Valentin's naïve sense of humour produced sketches that in spirit were loosely connected to dadaism, social expressionism and the Neue Sachlichkeit. Along with Karl Kraus, he is considered a master of gallows humor. His art centered mostly around linguistic dexterity and wordplay—Valentin was a linguistic anarchist. His comedy would often begin with a simple misunderstanding, on which he would insist as the sketch progressed. The notable critic Alfred Kerr praised him as a Wortzerklauberer, or someone who tears apart words and language to forcefully extract and dissect its inherent meaning. His sketches often parodied and derided "shopkeepers, firemen, military band players, professionals with small roles in the economy and the defence of society". Many contemporary artists, including film-maker Herbert Achternbusch and Christoph Schlingensief ("Valentin is one of the greatest for me! "), trace their artistic roots back to Karl Valentin. In 1959 based on private initiative the Valentin-Museum was established in the Isartor in Munich. This museum shows absurdities from parts of his legacy. A statue of Valentin was placed in the Viktualienmarkt in Munich. People still come and place flowers on this statue. Complete Works in 8 volumes. Edited by Helmut Bach Maier and Manfred Faust. Munich: Piper. Calandra, Denis. 2003. "Karl Valentin and Bertolt Brecht." In Popular Theatre: A Sourcebook. Ed. Joel Schechter. Worlds of Performance Ser. London and New York: Routledge. p. 189-201. ISBN 0-415-25830-8. McDowell, W. Stuart. 1977. "A Brecht-Valentin Production: Mysteries of a Barbershop", in Performing Arts Journal, Vol. 1, No. 3 (Winter, 1977), pp. 2–14. McDowell, W. Stuart. 2000. “Acting Brecht: The Munich Years," in The Brecht Sourcebook, Carol Martin, Henry Bial, editors (Routledge, 2000) p. 71 - 83. Schechter, Joel. 1994. "Brecht's Clowns: Man is Man and After". In Thomson and Sacks (1994, 68-78). Willett, John and Ralph Manheim. 1970. Introduction. In Collected Plays: One by Bertolt Brecht. Ed. John Willett and Ralph Manheim. Bertolt Brecht: Plays, Poetry and Prose Ser. London: Methuen. ISBN 0-416-03280-X. p.vii-xvii. ^ Michael Glasmeier, Karl Valentin: Der Komiker und die Künste (Munich: Carl Hanser Verlag, 198Michael Glasmeier, Karl Valentin: Der Komiker und die Künste (Monachium: Carl Hanser Verlag, 1987), str. 37.7), p. 37. ^ Kurt Horwitz, "Karl Valentin in einer anderen Zeit," Stürzflüge im Zuschauerraum (Munich, Piper Verlag, 1970), pp. 16-17. ^ Karl Valentin in Selbstzeugnissen und Bilddokumenten. Michael Schulte. (Reinbeck bei Hamburg: Taschenbuch Verlag, 1968), pp. 130-133. ^ "A Brecht-Valentin Production: Mysteries of a Barbershop", W. Stuart McDowell, Performing Arts Journal, Vol. 1, No. 3 (Winter, 1977), pp. 2-14. ^ "Acting Brecht: The Munich Years," by W. Stuart McDowell, in The Brecht Sourcebook, Carol Martin, Henry Bial, editors (Routledge, 2000) p. 71 - 83. ^ Brecht is shown participating in the Valentin sketch Oktoberfestschaubude (Octoberfest entertainment booth) in a photograph reproduced in Willett (1967, 145).